Bali Barber has become the “switchboard of the community and the shop where Bali’s business owners, expats, residents, and VIP visitors go for ultimate barber service at very reasonable prices. It’s definitely a common occurrence for friendships and deals to be made at the shop. We offer up full barber services such as scissor haircuts, clipper fades, as well as a Barber spa to attend to your nails, massage, waxing, skin and other aesthetic needs. Men's hair colouring is available and you'll be attended to by certified hair colorists using only high quality imported products. Walk In’s are welcome but easy online booking is recommended for groups, groomsmen, and services such as hair colouring, dreadlocks, spa services or gift packages. Gift Certificates available and Loyalty cards for frequent visitors. Bali Barber can be seen LIVE at any time on our webpage to get a feel for what we’re about and if we’re busy if you’re thinking of visiting without a booking. We had to set up this location because everyday we were sending Barber teams from Seminyak to Southern Bali to support the weddings held in the many resorts, hotels, and luxury villas in the area., Now groomsmen have a choice to visit our location in Bali Collection Mall or have us set up an exclusive pop up barbershop in the comfort of their venue. Wedding photographers absolutely love this as it's a great way to capture the groomsmen in a candid setting. 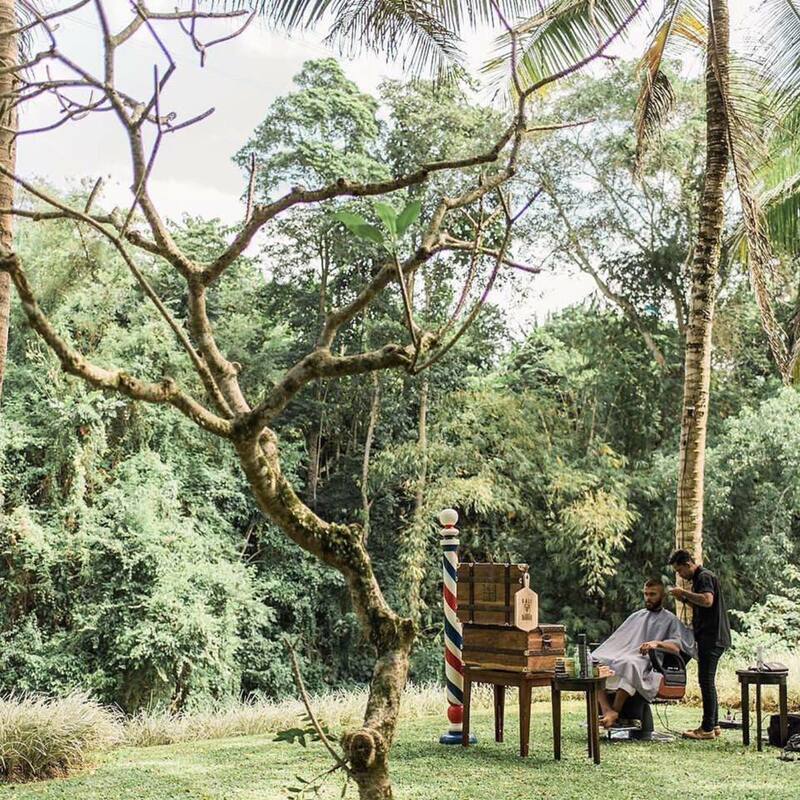 A barber session for the groomsmen is a time honored tradition - there's no reason to skip that during your Bali wedding. Serving the Nusa Dua, Tanjung Benoa, Sanur, Jimbaran, and Uluwatu community and within a 5-15 minute drive of some of Bali's most fantastic hotels in Nusa Dua, including St. Regis, Mulia, The Ritz Carlton, Samabe Villa, Grand Hyatt, Amannusa, Ayodya, Novotel, Marriott Courtyard, Nikko, Swiss Bell, The Mantra, Sekar Nusa, The Bale, Mecure, The Grand, Bali National, Amaris, Villa Kayu Manis, Grand Whiz, Club Med, Laguna, Sol Beach House, The Royal Santrian, Conrad, Aston, Ibis, Imaya Putri, Radisson, Peninsula, Holiday Inn, The Melia, and many others. We're located within the Bali Collection in Area A and connected to most of the aforementioned hotels by free shuttle boss, and Kura Kura bus line. Nearbye you'll find BIMC hospital, Pasifika Museum (a must see), The Bali Blow Hole (another must see), Bebek Bengil for great crispy Indonesian duck, and Pirates Bay one of our favorite places to bring kids to enjoy their giant tree houses.